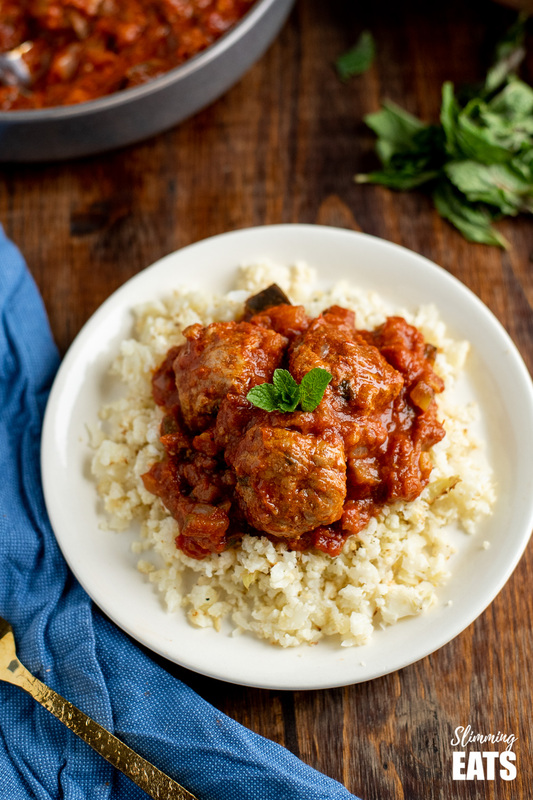 Tender Lamb and Mint Meatballs in a sweet and spicy sauce packed with healthy vegetables. Lamb is probably on the top of my list for my favourite meat to use in recipes and this simple but flavoursome recipe does not disappoint. 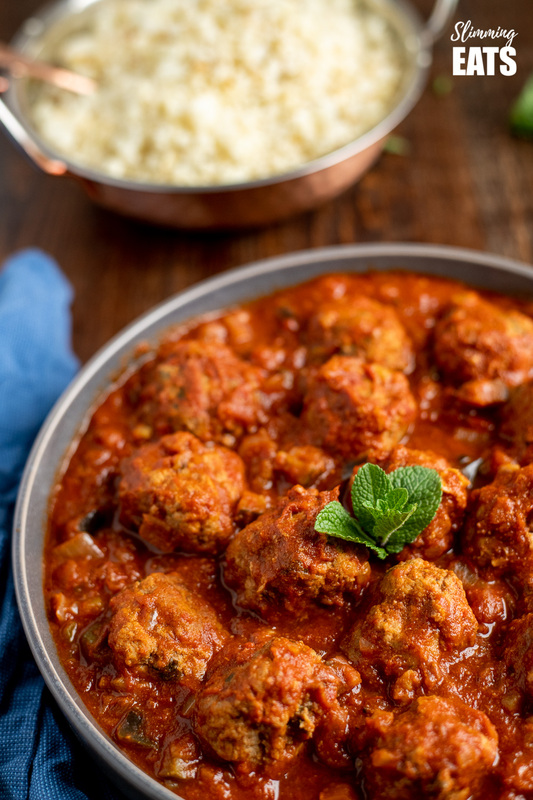 Simple juicy lamb meatballs fragranced with mint, shallots and garlic, simmered in an amazing sauce that will have you scooping up every last bit with a spoon. 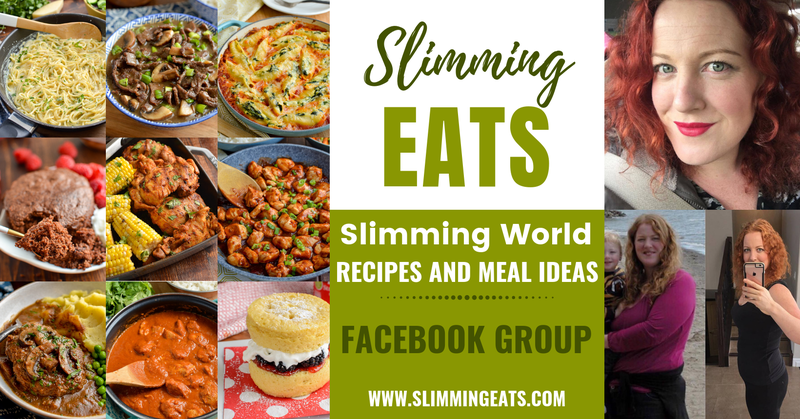 When it comes to ground lamb, many tend to avoid it on Slimming World, as extra lean less than 5% fat ground lamb is pretty impossible to find unless you are making it yourself, which means it’s not going to be syn free and we all know how much you love the syn free recipes. However, it really doesn’t need to be and shouldn’t be avoided. It’s such a great ingredient to use and really has an amazing flavour. 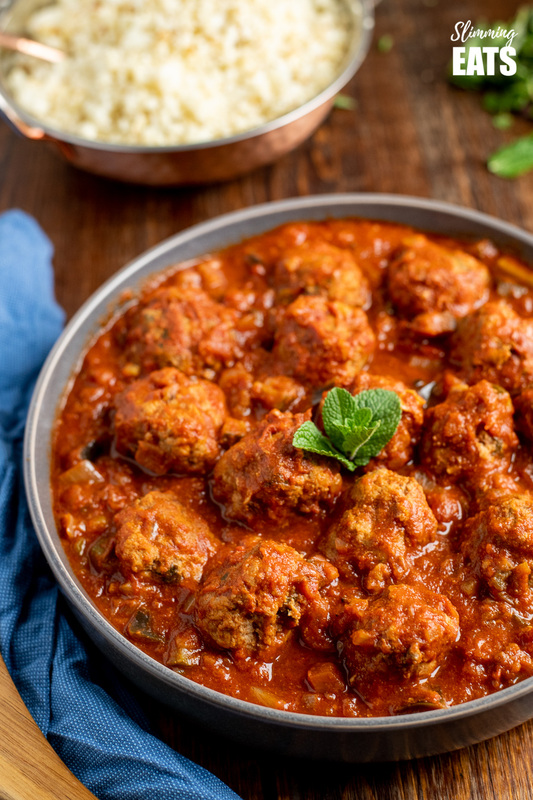 Plus when you use less and combine it with lots of delicious vegetables, like in this Lamb and Mint Meatballs in a sweet and spicy sauce recipe, divided up into portions is not really many syns at all. Remember this is a lifestyle change. If you carry on just sticking to syn free meals, it’s going to become boring very quickly and you will drift off plan. Sometimes you just need to use the odd ingredient that does have some syns to make your meals more enjoyable and flavoursome. That is exactly what your daily syns are there for. Being sensible and healthy doesn’t mean you need to compromise on flavour for the sake of saving a few syns. 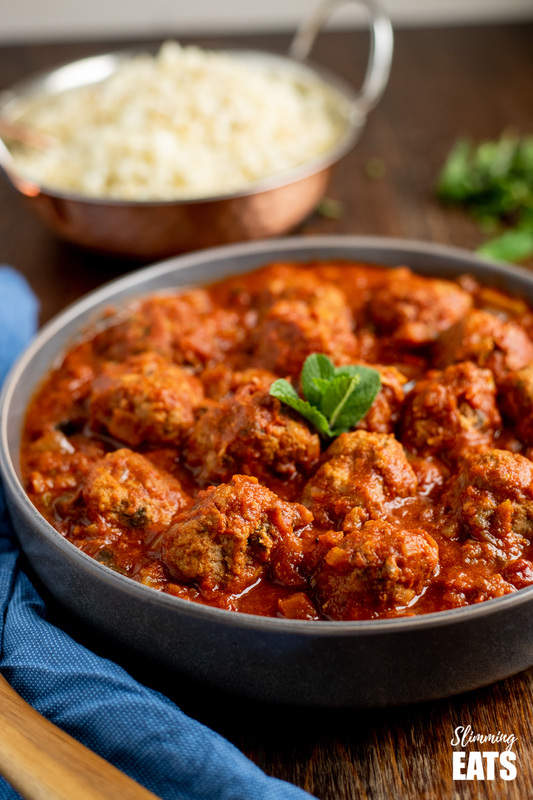 Of course, if you really can’t bear to use syns on some ground lamb, this dish would also work well with some extra lean ground beef or you could keep the lamb flavour by using some lean stewing lamb instead, just simmer in the sauce for a little longer than you would the meatballs, to ensure that meat is falling apart tender. 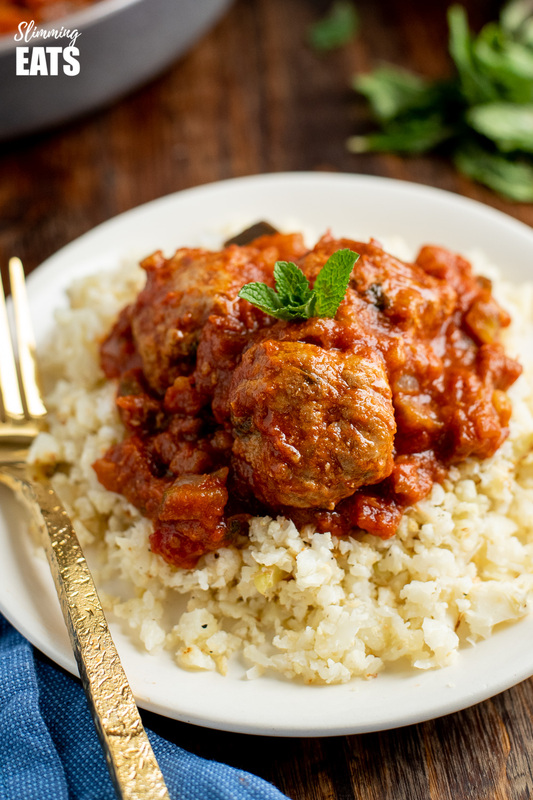 How can I add a 1/3 speed foods to these Lamb and Mint Meatballs in a Sweet and Spicy Sauce? The sauce is super packed with vegetables such as onions, passata, aubergine (eggplant) and zucchini but I love to serve this with my Roasted Cauliflower Rice for some additional speed foods. 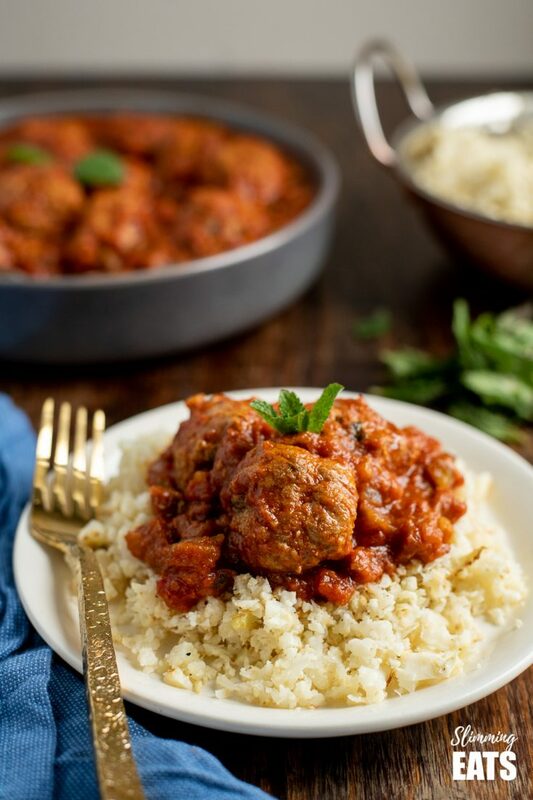 If you can’t do without your regular rice, try serving it with a 1/3 of your plate filled with some Roasted Cauliflower florets, which are a perfect side to these Lamb and Mint Meatballs in a Sweet and Spicy Sauce. In a large bowl, add the lamb mince, shallot, 2 crushed garlic cloves, mint and egg and bind all together. Form into meatballs, the mixture should make 12 medium sized meatballs (3 each). 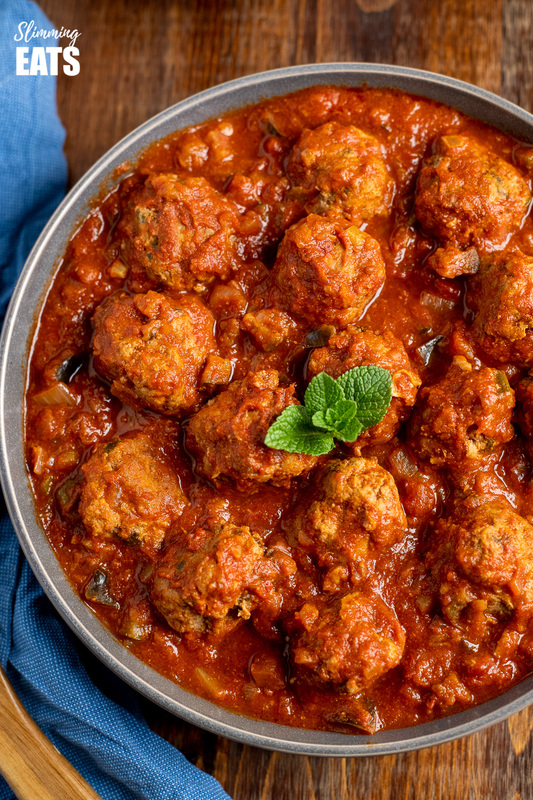 Spray a frying pan with some cooking oil spray and place over a medium high heat and lightly brown the meatballs on all sides, remove and set aside. Add the sweet onion, garlic and ginger to the frying pan, along with a couple of tablespoons of the stock, and cook for 3-4 minutes until softened. Add in the courgette, zucchini, all the spices, crushed tomatoes, brown sugar and remaining stock and bring to a boil, cover and simmer for 40 minutes. Dropping the meatballs into the sauce for the last 20 minutes. Serve with your choice of sides and garnish with fresh mint. NOTE: Lean Lamb mince can vary in san value, so double check the one you use. WOW!!!! Had this with Couscous, and it was AMAZING!!! Hubby has said it was bar far one of the best things I’ve ever cooked, and we’ve been married 12 years! 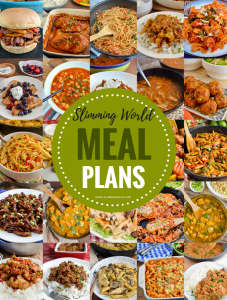 It was so easy, and fantastic on the calorie count – thank you Slimming Eats!!! they are a variety of onion with a sweeter flavour, just use any onion, if you can’t get them.